What Will HP Unveil at Today’s WebOS Event? A tablet, a phone, and more–we hope. 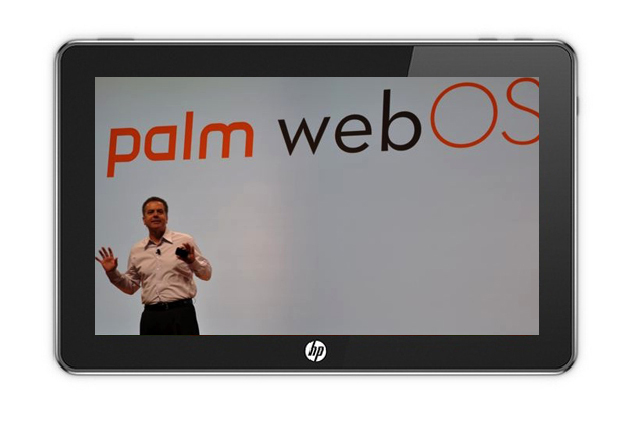 At an invitation-only event in San Francisco today, HP is expected to unveil its first webOS hardware since buying Palm in April 2010 for $1.2 billion. What exactly might we be seeing today, at 10 AM Pacific? We hope it will be HP’s answer to the iPad, the “PalmPad” (not, probably, it’s real name). We don’t know much about HP’s tablet, but here are some of the rumors being bandied about. It looks like HP actually has two tablets in mind, a larger, nine-inch model called “Topaz,” and a smaller seven-inch one called with the codename “Opal.” The design is rumored to be button-free, to have a front-facing camera, a micro USB port, and three speakers (two on the left, one on the right, enabling a stereo effect in both landscape and portrait). WiFi-only, AT&T 3G, and Verizon LTE versions of Opal could hit stores as soon as September of this year, with an AT&T LTE version by July 2012, according to the rumors. During CES this year, HP’s Todd Bradley told CNBC that HP was going to do the iPad one better. “You and I will talk about that on the 9th,” he said. With a line like that, if the event doesn’t unveil a webOS tablet, it’ll be something of a let down. That said, it’s altogether possible that we may only hear about a smartphone or two today. An invitation for the event back in January had the tagline: “Think big. Think small. Think beyond.” No company would boast of “thinking small,” unless it were a pun about small gadgetry–in other words, a smartphone. If we had to wager, there will probably be three announcements today, one corresponding to each of the sentences in the tagline. “Think big”–the PalmPad. “Think small”–one or more phones. “Think beyond”–generally, more information on webOS 2.0, which PCMag has speculated might be used as a secondary or pre-boot environment for Windows PCs, or as an OS for simple netbooks. We might also learn about new cloud-based services accessible from webOS devices. Stay tuned to this space. We’ll be covering the announcement as it unfolds!